A flock of birds is out for revenge after a gang of cats steals their eggs! Match clusters of birds to clear a path to the hatchlings and reclaim what belongs to your finely feathered friends. 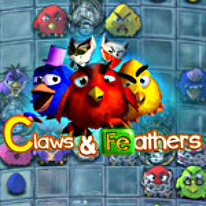 With dozens of challenging levels, colorful graphics, and a storyline that will have you squawking with laughter, Claws vs. Feathers will provide hours matching fun! -Six types of enemies! Challenge your skills! -Amusing storyline and funny characters! -Full HD graphics - 1920x1080!